To keep Rollins or not to keep Rollins? What do the Phillies do at shortstop? Jose Reyes is far and away the best shortstop available and an enormous upgrade over Rollins. But money doesn’t grow on trees quite as quickly as in Yankee-land. Reyes is not just a replacement for Rollins; he would mean a complete change in the Phillies off season strategy. Grabbing Jose Reyes deserves its own discussion altogether and I’m not going to touch it for now, but suffice it to say that I would rather spend my money elsewhere. Back to Rollins and the other free agent shortstops. I’ll break it down into two simple categories, Defense and Offense. Here's a look at the fielding percentages (just at shortstop) among the free agents (excluding Reyes). Player 2011 Fielding Pct. Career Fielding Pct. If the Phillies part ways with Rollins, they will lose the best fielding shortstop of the free agent crop by far. Rollins was tied for first with John McDonald for the best fielding percentage at .988. And Rollins’ career fielding percentage is 9 points higher than anyone other than McDonald (who can’t hit and only played one year). Rollins isn’t as quick as he used to be, but he still has more range than most of them. By the way, Jimmy's .984 career fielding is better than Jose Reyes has done in any year. Here are the 2011 offensive numbers for free agent shortstops. Are there any good free agent options at shortstop? Now that we've seen the numbers, let's see what options the Phils have other than Rollins. It's not difficult to narrow down most of the competition. We can immediately eliminate John McDonald who is 37 and has a .238 career average and hit .229 last year. Ronny Cedeno is out, as well, with relatively poor numbers across the board. The Phillies are simply not going to throw any bad gloves behind this starting staff, so that rules out Furcal, Betancourt, and Renteria, who have pedestrian offensive totals anyway. That leaves us with Gonzalez and Cabrera. Gonzalez hit 15 homers (1 less than Rollins), his average (.241) was 27 points lower than Rollins, his on-base percentage (.270) was 68 points lower. and his defense is inferior. Sorry Alex, but you are simply not an upgrade. Cabrera has a solid average (.273) and hit 25 HRs and knocked in 92, but he is slightly lower in on-base percentage with half the steals. Defensively his .975 career fielding percentage and .968 are suspect. Orlando Cabrera is the only shortstop worth consideration, but he is not the answer. His power is nice, but he doesn't work the count, manufacture hits, or create runs, which is what the Phillies desperately need. And without a solid glove, what purpose would it really serve? If the Phillies want a new shortstop, they will have to get a little creative. I'll do more digging on this over the off season, but here's one more nugget for you. Check out Wilson Valdez, whose fielding percentage (.971 last year and .980 career) is second only to Jimmy Rollins and compares offensively with everyone else. Would ya? Jonathan Papelbon is coming to Philadelphia. The Phillies signed a proven closer with 219 career saves, to go along with a 2.33 ERA, and two World Championships to his name. The Phillies may have just signed the best closer in baseball. Then why does it feel like we handed our money to Bernie Madolf? It would be foolish to label this a bad deal, but I just get the feeling that in four years we will wish it was Ryan Madson coming out of the gate in the ninth. It’s easy to see why Ruben Amaro prefers Papelbon in red pinstripes. Papelbon is clearly the more accomplished pitcher, having closed for six year in the Boston pressure cooker, while Madson has only held the role of closer for one season. And Papelbon’s career 2.33 ERA is far superior than Madson’s 3.59 ERA. Papelbon’s accomplishments are nice, but all that really matters here is which pitcher makes the Phillies better. Since Madson struggled in two of his first three seasons and spent one as a starting pitcher, the real comparison begins after Madson found his groove in 2007. How does Papelbon compare to Madson? Here are Papelbon's and Madson's numbers over the past five seasons from 2007-2011. Over the last five seasons, Papelbon is superior in every important statistical category by a fairly significant margin. Especially considering Papelbon was the closer for all five years, there's no question that Papelbon is the better pitcher during this timeframe. In the last three seasons, Papelbon still outshines in most categories, but Madson wins in ERA, HR/9, and BB/9. It’s like choosing between six glazed doughnuts and six jelly doughnuts; you can’t go wrong with either choice. The problem is that due to two contrasting styles, Papelbon's statistics are more likely to decline than Madson's. Papelbon is similar to Lidge in 2008 with a mid-90's fastball and a hard splitter. As we experienced with Lidge, once the fastball goes, hitters have a much easier time laying off the slider and will find themselves in more hitter's counts. Madson, on the other hand, also has a mid-90's fastball (slightly below Papelbon) to accompany a great changeup, as well as a cutter. When Madson loses velocity on his fastball, he can still rely on the change in speed of his changeup. Another difference, as David Murphy pointed out, is that Papelbon is much more of a fly ball pitcher. In the last three seasons, Papelbon's ground ball/fly ball ratio is .52 compared to .95 for Madson. Nearly double the fly ball outs in a bandbox like Citizens Bank Park is a dangerous combination. But Papelbon is here and that will not change, so second-guessing now is a futile endeavor. On the bright side, waiting around for Scott Boras to drag his feet with Madson could result in the Phillies losing both pitchers. That is too great a risk at this point, so let's give points to Ruben for pulling the trigger and making a decision. Four years from now, Papelbon might be finished, but we might have a few more championships in the process. When that happens, people might be asking, "Who is Ryan Madson?" Bud Selig announced on Thursday that the Houston Astros are moving to the AL West in 2013, as well as the addition of one Wild Card team to each league. I'm normally quick to pounce on any of Bud Selig's clear money making schemes, as Selig is quite content with his slow destruction of the tradition of our national pastime as long as it makes money. These two new decisions by the greedy, disheveled, sloppy, Selig are no different. Moving the Astros allows for more interleague games and makes the owners more money. Adding two Wild Card teams also squeezes out just a little more cash. Baseball traditionalists like myself hate most of Selig's moves that bit by bit have been breaking away the beautiful traditions that make baseball baseball. Instant replay, all-star games that "count," Wild Card teams, interleague play, and rampant steroid use which has tainted the record books all occurred during Selig's tenure. Even though these decisions turned out to be pretty good ones, my fear of robots behind the plate, automatic instant replay for everything, and half of the teams making the playoffs increases every day that Selig remains in office. Two more Wild Card teams is just another baby step in the process. But the unintended consequence of more Wild Card teams is one baseball traditionalists should approve. In the new format, the two Wild Card teams will have a one game playoff to determine who plays in the NLDS. Believe it or not, that actually makes winning your division more, not less important. 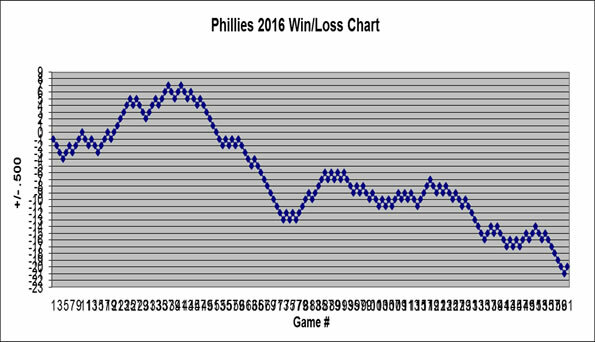 The Cardinals were 12 games worse than the Phillies in the regular season, yet the only disadvantage they had was one less home game per series. Under the new rules, the Phillies would be guaranteed a playoff spot, while the Cardinals's season might end after just one game against the Braves. In 2012, teams will not be happy to settle for the Wild Card, because it may only add one game to their season. There's no question that was not Bud Selig's rationale, but sometimes greedy guys do good deeds by mistake. Trading for Ty Wigginton is a good “only if” move. Wigginton is a good trade by Ruben Amaro “only if” it is not his final bench move. The Phillies needed a utility man who could play third, first, and maybe outfield, and Wigginton fits the bill. His .245 average over the last two seasons won’t wow you, but he averaged 18.5 homers over that span. Since Wigginton is probably replacing either Valdez or Martinez, it is a serious upgrade offensively. Wigginton carries a $2 million price tag, which is not a lot in general, but it is pricey for a bench player. But adding Ty Wigginton does not address the main problem which was exposed in Game 5 of the NLDS: the Phillies need more grinders. When the Phillies stared down Chris Carpenter, who was clearly on his game, they needed a fire-starter, someone who could get into Carpenter’s head. A bunt single, a bloop hit, or even a ten pitch out, ANYTHING to get some momentum on your side. In the tight games you find in the playoffs, it’s not the Albert Pujols that wins it for you, it’s the David Freese. Wigginton has a nice bat with some pop, but he offers more of the same approach at the plate. Just think, would Wigginton have made a difference in game five? Ruben Amaro said himself that the Phillies need better approaches at the plate, yet he then grabs a player with the same mentality. Rather than expecting the veterans and Charlie Manuel to change their philosophy, it is Ruben’s job to bring in some pieces who already employ that mind set. A player like Michael Cuddyer would have be a better fit than Wigginton. The fact that Cuddyer’s .277 average over the last two seasons is 32 points higher than Wigginton is a big reason, but he also averaged 13 more walks and 6 less strikeouts over his career than Wigginton. Not that Cuddyer would have been the right move since his asking price is significantly higher and likely too high for the role he would play on the Phils. The missing piece right now is a Larry Bowa or a David Eckstein, players who had no right playing professional baseball and annoyed the heck out of pitchers when they found their way on base. That perfect piece is out their somewhere. Pat Gillick was masterful and finding that one guy. Let's see if Ruben Amaro can find him this year.